For many, fine lines and wrinkles begin to develop in our 30’s and 40’s. The good news is that there is something we can do about it! There are non-surgical treatments available that can rejuvenate your skin. One such treatment is Juvederm®. Hyaluronic Acid and the Skin Before we take a look at this exciting treatment for common facial changes, it may be helpful to understand what happens to the skin over time. Factors like genetics and sun exposure certainly play a role in how our skin changes, but there is one factor that many people are unaware of, namely the role of a special substance called hyaluronic acid, otherwise known as “HA”. Hyaluronic acid is produced in adequate amounts when you are young, but as the years go by, your body produces less of it. In fact, 50% of the HA our body produces is depleted by age 50! The result of lost HA in our skin is more visible signs of aging: deeper lines or folds and lost volume to key areas such as our cheeks and lower face. We want to replenish HA back into our skin, as it has a special property of attracting and binding a tremendous amount of water molecules. Hyaluronic acid is present in most soft tissues and acts as a shock absorber between your joints. This moisture content also helps protect your skin cells from environmental damage, and helps plump your skin. A Look at Juvederm® The good news is that Juvederm® can help replenish this lost volume. Juvederm® is an injectable dermal filler containing the active ingredient of hyaluronic acid. Once skillfully injected into targeted areas of the face, Juvederm® goes to work rehydrating the skin and smoothing away fine lines and wrinkles or restoring support or volume to desired areas. When injected correctly by an experienced injector, it works safely and effectively. In addition, Juvederm® treatments require minimal down time. The Juvederm® Advantage One advantage of the Juvederm® family of products is that your results will look and feel very natural. 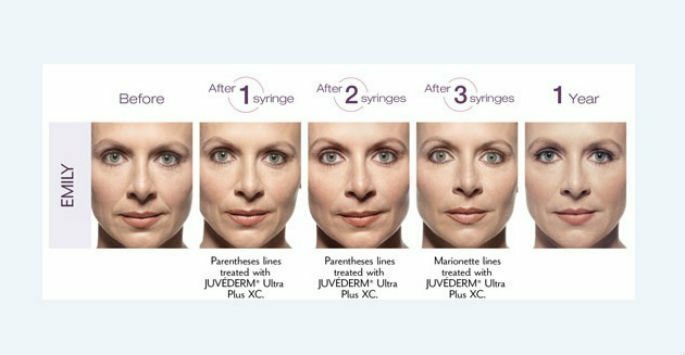 The Juvederm® HA filler has a unique formulation that utilizes HYLACROSS technology to create a remarkably smooth gel that flows very smoothly. It also contains lidocaine to enhance your comfort during the procedure. This treatment offers you the noticeable results you desire with the enhanced comfort you can expect. At ReFresh, we also believe that when injecting any dermal filler, great outcomes are also dependent on “who’s behind that needle and syringe”. We are confident that our certified and experienced aesthetic nurse specialists and nurse practitioners have what it takes to help you achieve your aesthetic goals. We invite you to schedule a consultation at ReFresh Aesthetic Center to learn more about how the Juvederm® family of products can work for you. Contact us today to book an appointment at our Center in Whitefish Bay.